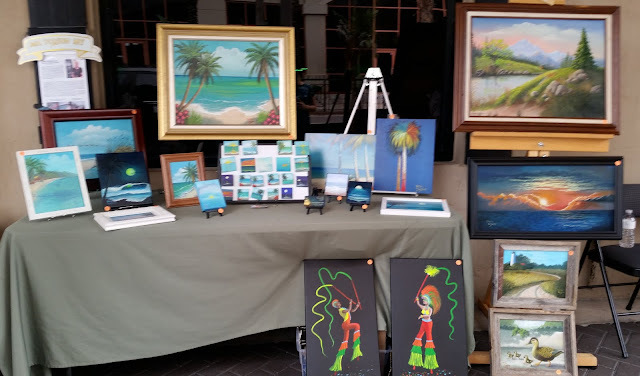 Well, my husband and I packed up all my supplies and headed up to the Jacksonville Beach Art Walk again. I didn't take as much as I usually do because it had been raining "cats and dogs" for the previous week and that morning. But we took a chance that the rain would cease. As it turned out the rain did end and the turnout was fairly good. Everyone coming by loved my work, but I just didn't sell that much except magnet paintings that are 2"x 2". I sold several of those! On the way home we had a long discussion as to whether I would continue to go to the Art Walk. Over the past months of observation, we realized that most of the sales are in the area of crafts and jewelry, not Fine Art. So I have decided that I will look for other means of selling my art. My husband is coming to my aid in improving and updating my website so that I can accept PayPal for sales. I am the first to admit that I am not "technically advanced" enough to do it. He is a retired data engineer and fully capable of doing it for me and best of all, he works cheap! LOL!! I also have a video from another artist on selling art through eBay. I haven't had time to watch it yet, but I am looking forward to doing so. This artist, Daniel Edmondson from Colorado, claims he sold over 200 paintings in a year on eBay and the video shows how he did it. Needless to say I am looking forward to watching it and learning his method of selling. Of course I will pass on as much as I am able. On another note, my art class began on Tuesday June 13th. I have 7 confirmed students and the possibility of one more joining on the 20th. We had a good time and the students were attentive as we went over basic information they needed to understand before we start painting. I discussed how to use the color wheel, the value finder and the different types of composition. We also went over the different brushes and their uses, stressing the importance of having good brushes. They are actually more important than the paint we use! I assured them that next class we will actually start a painting. My students range in age and skill level. One is a photographer, one is a novice, another is somewhat skilled and another skilled at drawing and fast learning to paint well. I also have three younger students. It will be interesting working with a wide range of skill levels. It will take a lot of personal attention with each student to determine their needs. We will try to paint three scenes. A seascape, a landscape, and possibly a flower garden. My husband was going to take a picture of the class, but he forgot, so the first opportunity will be next Tuesday, June 20th. But I will be sure to get a photo and post it then, OK? In the meantime I have a photo of my last Art Walk. I may attend one later in the year, but for now I am doing other things. In the center of the table are the 2" x 2" magnet paintings that sold like hotcakes! Just be sure to varnish yours well if you decide to paint some so they will last!